Handcrafted GOODNESS by the Gallon! 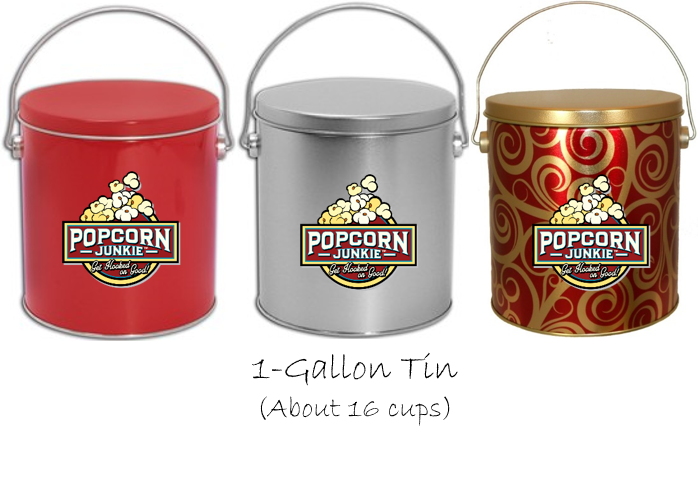 Satisfy your cravings with a TIN full of our handcrafted gourmet popcorn for yourself or someone special. As always, our gourmet popcorn is made FRESH daily! Tin designs shown in Red, Platinum & Gold Swirl. Additional tin designs available at check-out. The perfect gift, sure to deliver a SMILE! Select one delicious flavor to satisfy your cravings. Select one flavor or two different flavors. Create, savor & share your own unique mix of flavors! Tin designs shown in Red, Platinum & Gold Swirl. Additional tin designs available at check-out.